The purpose of service-oriented architecture (SOA) governance is to act as the catalyst between business governance and IT governance by ensuring optimal business value for services investments. Within SOA governance, there is service governance, which ensures that organizations build the right services, in the right way, at the right time, and then manage and reuse those services effectively. Service governance does this by overseeing the processes of proactively identifying, assessing, building, and managing high-value business services, those services that provide the greatest return on investment. Service governance requires a federated, end-to-end approach to service lifecycle governance and management, including knowing what needs to be strictly governed and where a lighter touch is more appropriate. As SOA evolves to be a fundamental and critical enabler for other efforts, such as IBM® Smarter Planet and Cloud Computing initiatives, it becomes more imperative to ensure quality SOA and service governance capabilities. These capabilities drive discipline and value for other areas, such as the governance of provisioning of assets, impact analysis, and asset/service portfolio management. 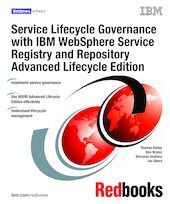 This IBM Redbooks® publication identifies the key functions and capabilities that are required for service governance based on field best practices and client scenarios. This expertise gives IBM the ability to deliver higher business value to our clients in more consumable ways and value that is fit for purpose delivery methods that match the way our clients operate.